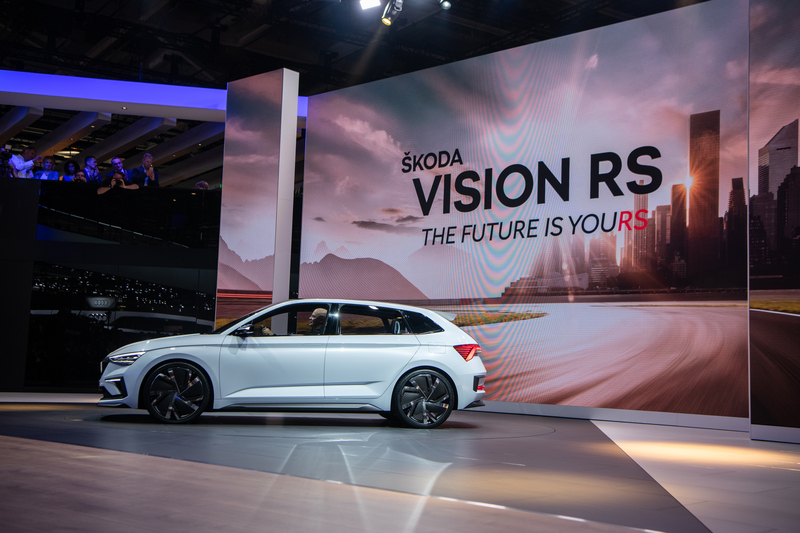 The ŠKODA VISION RS concept study and the lithe ŠKODA KODIAQ RS SUV have celebrated their world premières at the Paris Motor Show. ŠKODA Storyboard live streamed the event. Besides witnessing these world débuts, visitors to Paris can also admire the new ŠKODA KAROQ SCOUT, KAROQ SPORTLINE and OCTAVIA COMBI G-TEC. ŠKODA AUTO’s press conference also touched on the traditional Czech carmaker’s current situation and future direction. Electric drive. Environmental materials. Cutting-edge technology. All wrapped up together in the new VISION RS concept. This study promises a future that combines a fine driving experience with environmental responsibility. “The VISION RS is a plug-in hybrid drive. Its 1.5-litre TSI engine delivers output of 110 kW. This is supported by a 75 kW electric motor, giving the model a range of 70 kilometres on the battery alone – and therefore emission-free local driving. 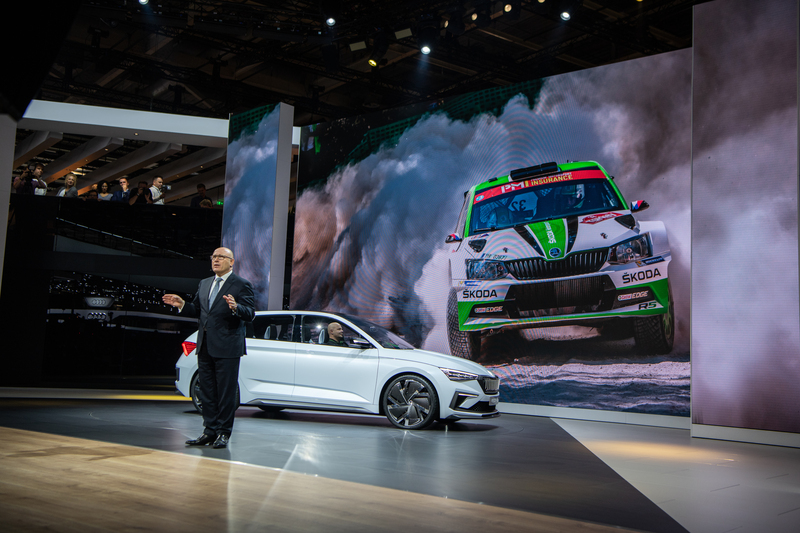 And best of all, thanks to the electric motor, the maximum torque is available from standstill,” said ŠKODA AUTO chairman Bernhard Maier at the official unveiling. “The VISION RS shows what our RS family of models might look like in the future. And as you know, our VISION cars always offer a hint of upcoming production models – especially when it comes to the exterior design,” he added. Inside the VISION RS concept study, you can also find new improved interior design features: a large, centrally positioned infotainment display, seat covers made with vegan materials, and advanced voice control. “Our best-in-class voice control will offer all key information on the vehicle, whether you’re at home or on the road,” Maier said. 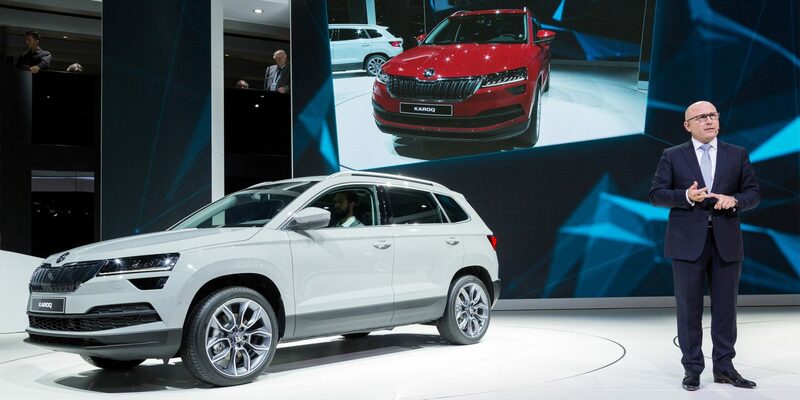 ŠKODA’s first lithe SUV is also seeing the light of day at the Paris Motor Show. 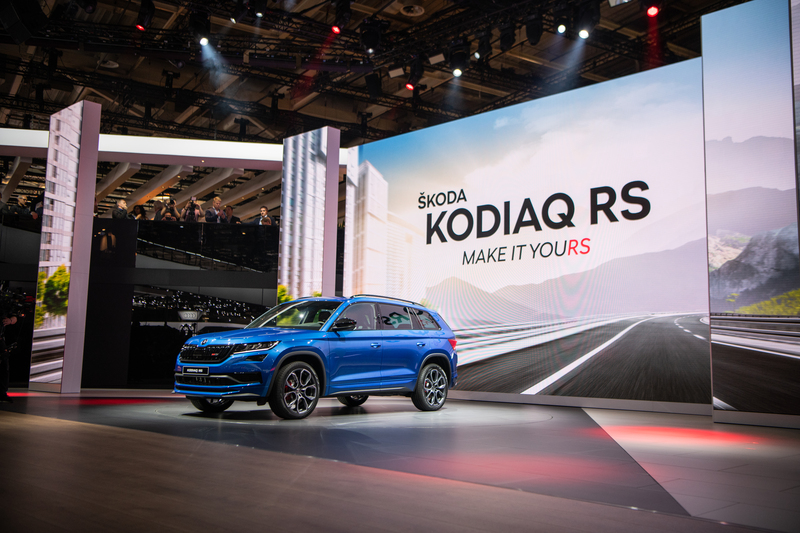 The KODIAQ RS earned its spurs before it was even unveiled by setting a track record for seven-seater SUVs at Germany’s famous Nordschleife, when it was put through its paces by Sabine Schmitz, the well-known racing driver who knows the circuit inside out. “Its modern, clean and highly efficient twin-charged diesel engine boasts 240 HP and 500 Nm of torque. 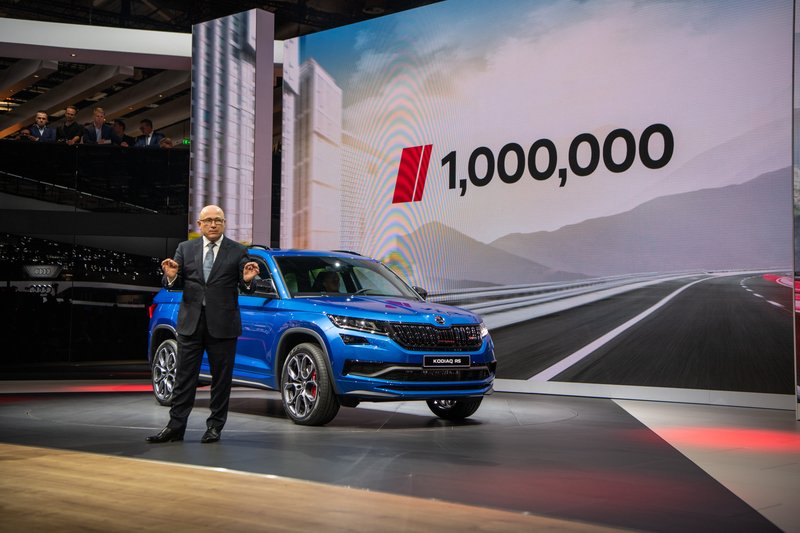 This is a perfect example of when athleticism meets exceptional everyday practicality,” explains Bernhard Maier as he introduces the KODIAQ RS. 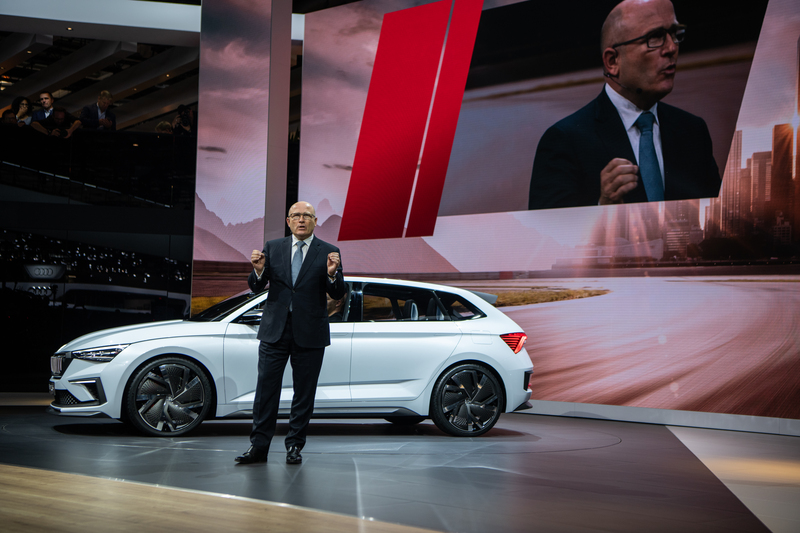 Discussing where the ŠKODA brand was headed, Bernhard Maier spelt out the carmaker’s ambition to become a major player on the global market. “Our millionth car this year will be rolling off the production line in a matter of days. We have achieved this magic number even earlier than in previous years,” Maier said. “I would like to thank our customers for their confidence in us,” he added. These days, though, the millionth car of the year is just a stepping stone. Once a lofty goal, this is now a springboard to ŠKODA’s new target of two million cars per year by 2025.